Caribbean Nations Feel Hurricane Matthew's Lash : The Two-Way Authorities warn of "life threatening" wind and flooding in Haiti and have issued warnings for parts of Cuba, Haiti and Jamaica. The U.S. Navy evacuated families from its base at Guantanamo Bay, Cuba. Heavy rain hits downtown Kingston, Jamaica, on Sunday ahead of Hurricane Matthew's expected arrival. The National Hurricane Center is warning that Hurricane Matthew will "bring life-threatening rain, wind and storm surge" to parts of Haiti beginning Monday evening. People on multiple Caribbean islands are preparing for the Category 4 storm. "Alta Jean-Baptiste, head of the Haiti's Department of Civil Protection, said one man was killed by large waves at sea over the weekend, and another went missing when his boat capsized, despite warnings to stay on dry land." "One man died Friday in Colombia and a 16-year-old was killed in St. Vincent and the Grenadines on Sept. 28 when the system passed through the eastern Caribbean." The U.S. has evacuated spouses and children of personnel at the Guantanamo Bay base in Cuba. On Saturday evening, the U.S. Navy announced it was transporting about 700 people to Florida using military aircraft and that "the remaining 4,800 personnel remain behind in order to quickly begin recovery efforts, and will shelter in place." The military prison's 61 inmates are housed in buildings that "can withstand the current projected storm strength and the detainees will shelter in place. If the storm should intensify there is a plan in place to move the detainees to alternate shelters," the Miami Herald quotes spokesman Navy Capt. John Filostrat as saying early Sunday. The newspaper adds that Filostrat "did not reply to a question on what category of hurricane the buildings currently housing the detainees and command staff could withstand." On Monday morning, the National Hurricane Center issued hurricane warnings for Jamaica, Haiti, the southeastern Bahamas and parts of Cuba, including Guantanamo province. Other parts of Cuba and the Bahamas, as well as the Turks and Caicos Islands, were under a hurricane watch, and part of the Dominican Republic was under a tropical storm warning. The center of Matthew is expected to approach Jamaica and southwestern Haiti tonight, and eastern Cuba on Tuesday, according to a public advisory from the National Weather Service. The National Hurricane Center predicted Monday that the storm will bring sustained winds of nearly 140 miles per hour, with significantly stronger gusts in some places. The most up-to-date public advisories and warnings about the storm are available on the National Hurricane Center website. Heavy rain has already begun in parts of Jamaica and Haiti. The National Weather Service says the total rainfall during the storm could be catastrophic, warning that "rainfall will likely produce life-threatening flash floods and mudslides." According to the latest forecast, 15 to 25 inches of rain was set to fall in southern Haiti, and some places could get as much as 40 inches if the storm moves more slowly. In eastern Cuba and western Haiti, between 8 and 12 inches of rain was expected. In Jamaica, the total was between 5 and 10 inches. In Haiti, where heavy deforestation increases the risk of mudslides and flooding, President Jocelerme Privert announced schools would be closed on Monday and Tuesday and that both international airports in Port-au-Prince and Cap-Haitien would be closed from 6 a.m. local time Monday to 6 a.m. Wednesday, according to the Miami Herald. Flooding could also increase the transmission of waterborne cholera, which has killed thousands of people in Haiti since it was introduced at a U.N. peacekeeping camp following a 2010 earthquake — for which the U.N. has admitted it played a role. 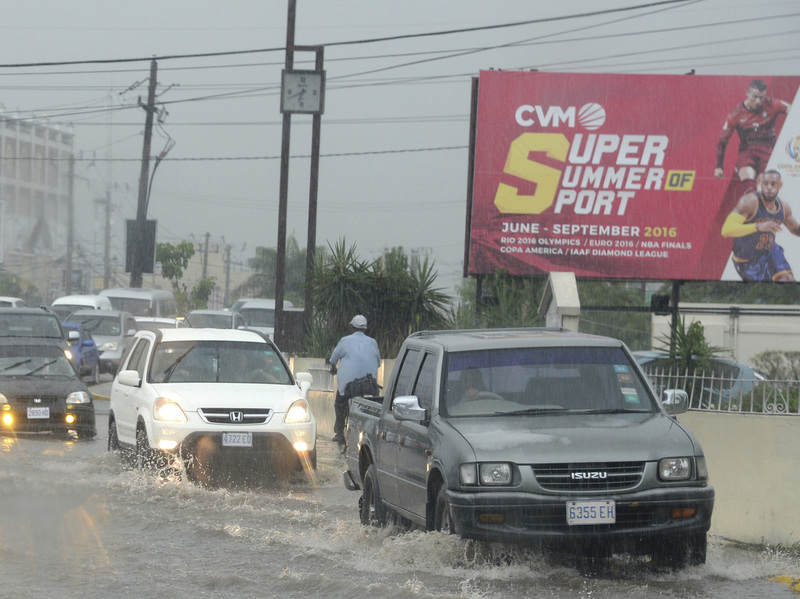 Jamaican authorities have set up shelters in the cities of Kingston and St. Andrew.